Our local history museums are looking back 100 years this summer to the time when the U.S. entered World War I. At the Monadnock Center, we are featuring an exhibit, 1917: Looking Back 100 Years, which explores what life was like here and the ways our communities supported the war effort. The exhibit includes vintage photographs, newspapers, posters, uniforms and artifacts. You can read a review of the exhibit here. 1917 will be on view through December. 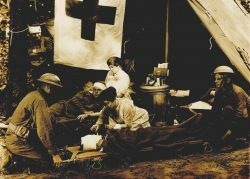 The Monadnock Center’s museum is open Wed- Sat, 10 a.m. to 4 p.m.
Antrim Historical Society opens their World War I exhibit on August 8.
bring these soldiers’ and citizens’ experiences to life, both abroad and here at home. See the exhibit at the Hancock Historical Society’s museum on Main Street on Sundays from 2 to 4 p.m. Admission is free but contributions are welcome. The exhibit will be open through September 17, 2017. 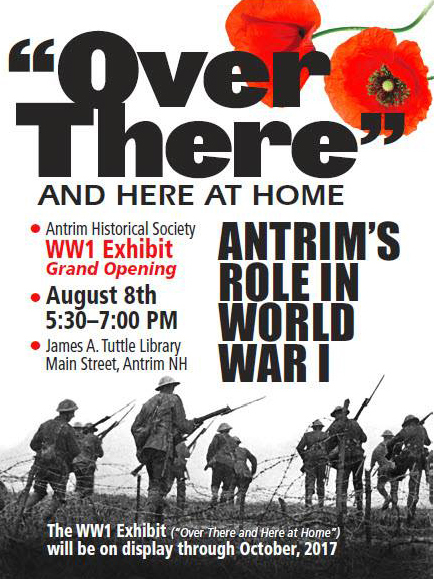 Our friends at the Antrim Historical Society will hold a grand opening of their new exhibit, Over There and Here at Home: Antrim’s Role in World War I, on August 8 from 5:30 to 7 p.m. The Antrim Historical Society’s rooms are located in the Tuttle Library on Main Street in Antrim. Over There and Here at Home will be on view through October 2017. A hundred years ago, the Francestown Improvement and Historical Society, held a Labor Day fundraiser to benefit the American Red Cross. 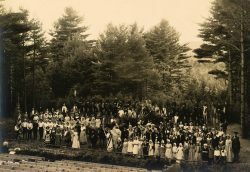 Since that time, the Francestown Labor Day festival has become a Monadnock Region tradition. Don’t miss this year’s special centennial celebrations on Labor Day weekend, September 1 through 4! See the schedule of events here. If you know of other World War I exhibits and programs happening in the Monadnock Region, let us know!